Stores don't need nearly as much retail space as they used to, and this is seriously hurting the country's real estate market. America has too many malls. I’ve recently blogged that many traditional brick-and-mortar retailers are being threatened with "economic destruction" by their advantaged online competition. In an interview with Bloomberg TV, anchorwoman Nicole Lapin asked about the implications of this dynamic on retail real estate. I said I hadn’t studied it, but I thought the ramifications would be very big and very negative (I believe the phrase "apocalyptic" was used). I’ve since had the opportunity to spend some time looking at this issue, and I believe we’re seeing clear signs that the e-commerce revolution is seriously impacting commercial real estate. Online retailers are relentlessly gaining share in many retail categories, and offline players are fighting for progressively smaller pieces of the retail pie. A number of physical retailers have already succumbed to online competition including Circuit City, Borders, CompUSA, Tower Records and Blockbuster, and many others are showing signs of serious economic distress. These mall and shopping center stalwarts are closing stores by the thousands, and there are few large physical chains opening stores to take their place. 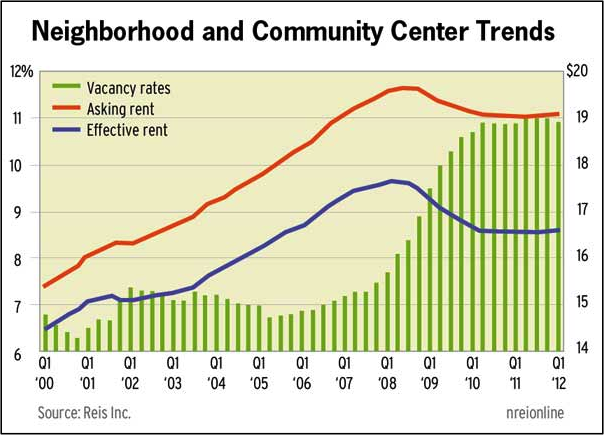 Yet the quantity of commercial real estate targeting retail continues to grow, albeit slowly. Rapidly declining demand for real estate amid growing supply is a recipe for financial disaster. I don’t think we’re overbuilt, I think we’re under-demolished. There are very few thriving physical retailers these days outside of the daily consumables markets. I did a quick analysis on the high-level health of the National Retail Federation’s list of the Top 100 retailers in 2012, focusing on merchandise retailers that would likely be located in malls (removing grocery, drug, restaurant and online retailers). I looked at three measures of retailer health: total sales growth, comp store sales growth and number of stores. The analysis doesn’t paint a very pretty picture regarding the health of the leading physical retailers in the United States. Total sales growth is mixed and is negative for 20 percent of the sample. Comp store sales growth—arguably the key measure of retailer health—is also mixed and a quarter of the sample is negative. And note that many of these sales results include the retailers’ online segments, so the picture for their physical stores is even worse. Lastly, store counts are simply stagnant—about as many top retailers shrank their store count as expanded it, and precious few are expanding aggressively. The largest retailers in the U.S. do not look very healthy. And if they’re struggling, it’s likely that their more marginal physical competitors are struggling even more. I went back to the Top 100 retailers in 2007 to see how that crop had fared five years later and found that four of these top retailers had already gone away through Chapter 11. Interestingly, the picture of these four doesn’t look that different than the 2012 list. 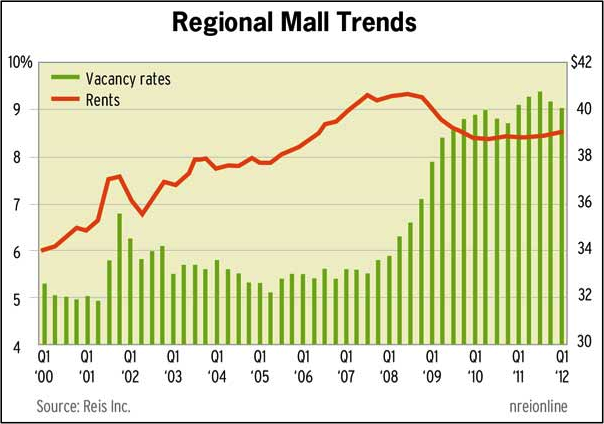 This declining retailer health is directly impacting malls and shopping centers in the form of very high vacancy rates and sluggish rents—exactly what you’d expect to see where supply exceeds demand. Both factors deteriorated quickly during the economic crisis of 2008-09, but they’ve shown virtually no improvement since in spite of improved economic conditions. The recession was the catalyst, but competition from online retailers can only be the continued driver. The mall business isn’t very healthy either. These trends are hitting the market capitalizations of most of the largest owners of retail real estate. Simon, General Growth, DDR and Kimco between them own over 600 MILLION square feet of U.S. retail real estate, according to nreionline. 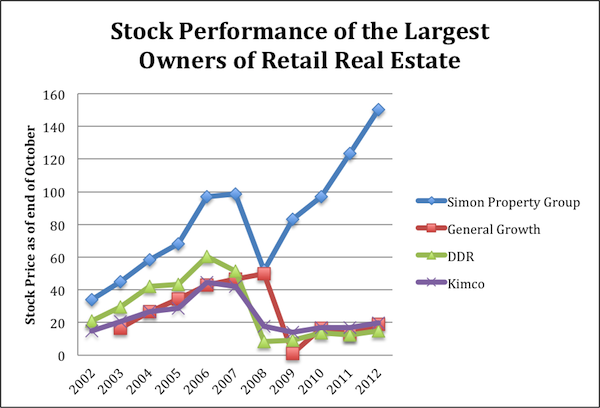 Simon’s stock has performed strongly, but the other three stocks have created virtually no value over the past decade. Green Street Advisor, an analysis firm that tracks REITs, has forecast that 10 percent of the roughly 1,000 large malls in the U.S. will fail within the next 10 years and be converted into something with far less retail. That’s a conservative estimate; many mall CEOs predict the attrition rate will be higher. And Daniel Hurwitz, president and CEO of DDR, observes, "I don’t think we’re overbuilt, I think we’re under-demolished." I agree with the above perspectives, although I believe they likely understate the eventual impact on malls. A report from Co-Star observes that there are more than 200 malls with over 250,000 square feet that have vacancy rates of 35 percent or higher, a "clear marker for shopping center distress." These malls are becoming ghost towns. They are not viable now and will only get less so as online continues to steal retail sales from brick-and-mortar stores. Continued bankruptcies among historic mall anchors will increase the pressure on these marginal malls, as will store closures from retailers working to optimize their business. Hundreds of malls will soon need to be repurposed or demolished. Strong malls will stay strong for a while, as retailers are willing to pay for traffic and customers from failed malls seek offline alternatives, but even they stand in the path of the shift of retail spending from offline to online. This in turn creates further opportunity for online commerce. If I were thinking of starting a new retail brand right now, I would unquestionably start it online. And many very talented entrepreneurs are doing just this. I personally shop at Bonobos for pants, J.Hilburn for sweaters, Ledbury for shirts and Warby Parker for eyeglasses. All of these brands design and source their own goods. They historically would have started in the mall but they now are starting online, a trend that will undoubtedly continue. There clearly will be fewer new offline retailers to take the space vacated by the disappearing brick-and-mortar chains, further pressuring malls. And in an ironic turn, many of these online brands are experimenting with offline stores—but typically with some important twists. Bonobos and Warby Parker have built showrooms in their New York offices where consumers can come in and try on samples. But if the consumer wants to purchase items, then the companies fulfill the product from their warehouses—they don’t stock inventory in their "stores." Bonobos has expanded this concept into a few additional locations, but not mall locations. Instead, they are selecting lower cost, non-mall locations and using emails to their online customers to drive folks to these locations. They do this because a consumer’s purchasing typically expands after a visit to their physical store, and the costs are not high given the lack of inventory and lower rents and staffing costs. If this trend expands, it will provide further challenges to malls. I started deadmalls.com with my friend Peter Blackbird in 2000 when we both realized that Pete had mountains of data about dead and dying malls stuck up in his head. Why keep this information to yourself? And, realizing the burgeoning power of the Internet and its ability to draw in more information, the site was created to harness stories of woe and merriment from others. It’s been a great success. Unfortunately for mall owners, the content on deadmalls.com is about to expand substantially. There just are too many malls in America, and this will only get worse. Jeff Jordan is a partner at Andreessen Horowitz and is on the boards of AirBnB, Belly, Fab.com, Circle, Lookout and Pinterest, as well as OpenTable, Wealthfront and Zoosk.